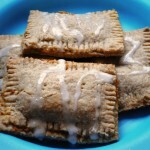 Homemade versions of Pop Tarts are popping out all over the place these days. First we saw this great feature story on make-your-own toaster pastries (we’ll call them that so we don’t step on any trademarking toes) in the L.A.Times food section. Their featured variety has a French-style almond paste – quite a step up from the usual fruit spread. 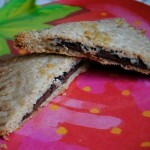 Then Savoring the Thyme this week featured their Nutella strawberry white chocolate toaster pastries. 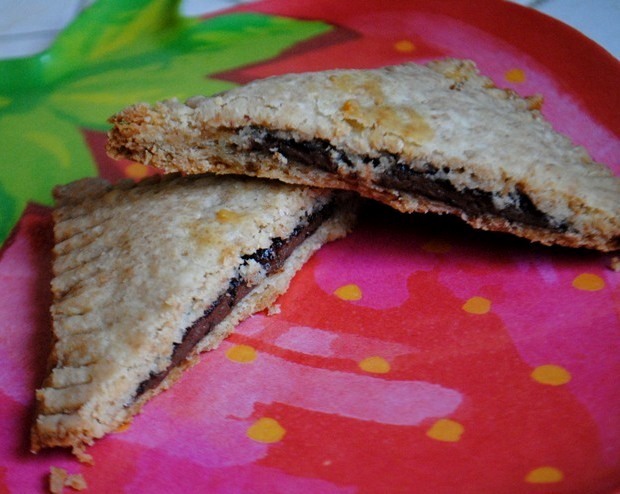 And they were inspired in turn by Family Kitchen’s Nutella version. There sure must be a lot of busy toasters out there. While we were researching toaster pastries (sounds like a great topic for a dissertation, right?) multiple sources directed us toward Smitten Kitchen’s version, which creates a dough that’s more sturdy than flaky, perhaps best suited to toasting and travel. We took Smitten Kitchens’ suggestion to substitute some whole wheat flour for the white flour. Even with that subsitution, the dough was easy to work with and easy to roll out (probably because of the entire cup of butter). Preparation note: When cutting your strips of dough, don’t make the same mistake we made with sloppy cutting the first time around. Keep the measurements exact so that your top pieces line up with your bottom pieces. 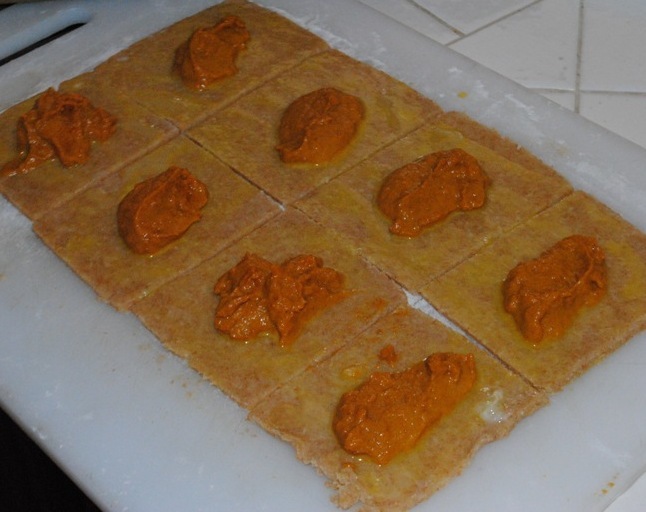 For the inside, we were inspired by some leftover pumpkin puree to make pumpkin filling, which is one variety that you’re almost certain never to see in your grocery aisle. 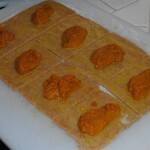 (Jolly Tomato’s pumpkin toaster pastry filling: Mix 1 cup pumpkin puree, 1 T brown sugar, 1 tsp sugar, 1/4 teaspoon salt, 1/4 teaspoon cinnamon, and 2 tablespoons evaporated milk.) Oh, and we also made a few pastries with peach jam and a few with Nutella, because, well, who doesn’t like Nutella? In the end, they came out tasting like very good little pieces of pie – somewhat flaky and very tender. “It’s missing that cardboard flavor that you might expect,” observed one of our taste testers wryly. We definitely wouldn’t bring these on a hike or put them in a lunchbox, for fear they would dissolve into flaky crumbs, but that didn’t matter so much because we were more than happy to eat them on the spot, right out of the oven. Extra bonus: We drizzled a little bit of simple powdered sugar frosting (1/4 cup powdered sugar plus 1/2 tsp milk) to make it more like the “real thing.” Or maybe just because it was fun. 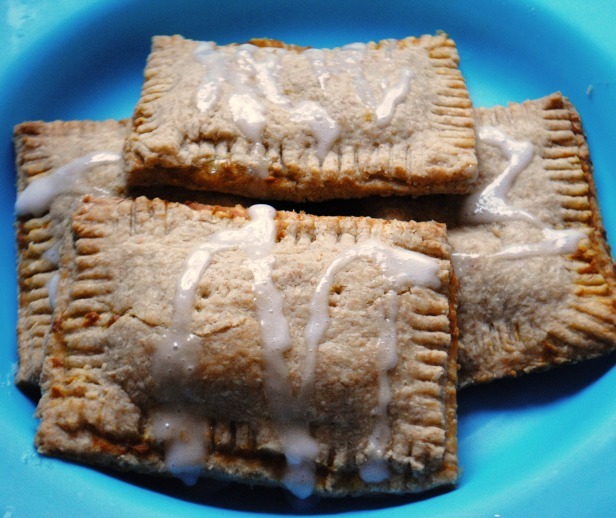 Special thanks to Jolly Tomato’s dad – who has never in his life eaten an actual Pop Tart – for the pictures.